Budget 2019 – 7 ways to become a non-taxpayer. Finance Minister Piyush Goyal’s 2019 interim budget offers mega tax benefits to salaried and middle-class taxpayers of India. This budget is a forerunner of the general elections and hence naturally some sops were expected. But the Finance minister has surprised all folks by pushing the minimum income level which attracts tax to a higher level. Applicable Tax Rules After 2019 Budget – Highlights. No Changes in the income tax slabs and rates – What does that mean? Section 87A – Changes proposed in 2019 Budget. 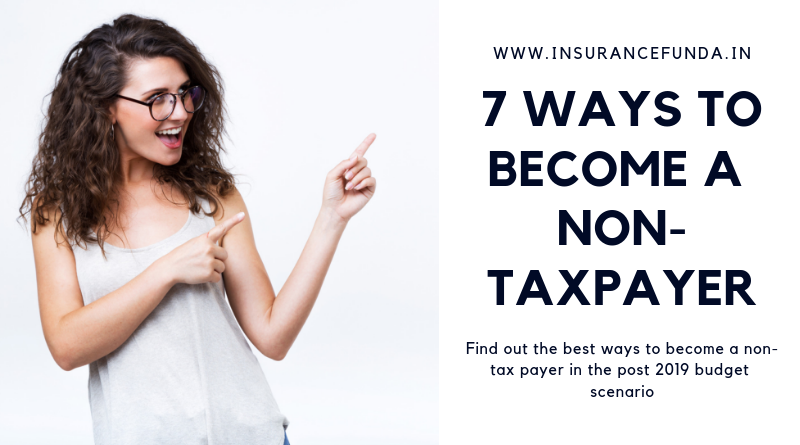 7 ways to become a non-taxpayer in the post-budget scenario. Income Tax Deductions – Simple Calculator. No Income Tax for gross taxable income up to 5,00,000. A tax rebate of Rs 12500 u/s 87A will be applicable to all tax payers whose taxable income is less than or equal to 5,00,000. The standard deduction for Salaried Employees has been hiked from Rs. 40,000 to 50,000. Section 80C rebates will remain at Rs. 1,50,000. Interest portion on home loan up to 2,00,000 will remain to get tax reliefs. TDS threshold on interest earned on bank/post office deposits will be raised from 10,000 to 40,000. Rebates u/s 80D and rebates for handicapped dependants will remain. Prevailing Income Tax Slabs and corresponding tax rates for the financial year 2018 – 2019 will hold good for 2019 – 2020 financial year also. Applicable Tax slabs and rates are given in the table below. As per the budget declaration, no tax will be levied if the taxable income is up to Rs. 5,00,000. But if the taxable income exceeds Rs 5 Lakh even by Rs. 1 you will have to pay tax applicable as per the existing slabs. This trick happens due to the section 87A rebate which is applicable only when taxable income is less than or equal to Rs. 5,00,000. In other words, The new exemption will become applicable if and only if you can keep your taxable income below 5 lakhs. As the famous saying goes, for all others there is really nothing new under the Sun. Section 87A rebate applicable for the financial year 2018-19 is for all tax payers whose taxable income is less than or equal to Rs 3,50,000 and the tax rebate available is just Rs 2,500. As per the proposed change Section 87A rebate will become applicable to all whose taxable income is less than or equal to Rs. 5,00,000 and the applicable rebate is Rs.12,500. You cannot forego your income for the sake of avoiding tax. But you can bring it down using various rebates and provisions available. Let us see the possible options one by one. Under Section 80C of income tax act, total deductions up to 1,50,000 is allowed. That means you can reduce up to Rs 1,50,000 from your total taxable income through section 80C. So if your total income is up to 6.5 lakhs, you can become a non-taxpayer by this section alone, provided you have enough investments under section 80C. Read more on the deductions available under 80C here. Interim Budget 2019 proposes to increase the standard deduction available to salaried class from Rs. 40,000 to 50,000. If you are a salaried employee, you can further reduce your income by another 50,000 to make your income below 5,00,000. A deduction of Rs. 25,000 can be claimed for insurance of self, spouse and dependent children under section 80D. An additional deduction for insurance of parents is available to the extent of Rs 25,000 if they are less than 60 years of age or Rs 50,000 if parents are more than 60 years old.If both parents and tax payers age is 60 years or above, the maximum deduction available under this section is to the extent of Rs. 100,000. So you can get a deduction up to 1,00,000 under this section if you are eligible. Expenditure incurred on medical treatment (including nursing), training and rehabilitation of handicapped dependent relative. Payment or deposit to specified scheme for maintenance of dependent handicapped relative. Where disability is 40% or more but less than 80% – fixed deduction of Rs 75,000. Where there is severe disability (disability is 80% or more) – fixed deduction of Rs 1,25,000. An amount up to Rs 40,000 can be deducted towards the expenses incurred towards treatment of certain specified medical diseases or ailments for himself or any of his dependents. You can claim a deduction of up to Rs. 2 lakhs for the interest paid on your home loan. But both the following condition should be satisfied to claim home loan benefit. You can claim an amount up to 50,000 for the contributions to National Pension Scheme(NPS) under section 80 CCD(1B). This becomes applicable only when you have exhausted your 1.5 lakh limit of 80C account only. Above comparison shows the difference in tax calculation in the existing and proposed system. Example – 1 Shows the calculation of a person with Salary income of Rs. 12,00,000 and Example – 2 shows the same calculation if the income is Rs. 10,00,000. In Example – 1 the gain is just Rs 2080 but in Example -2 where the income is Rs 10,00,000 gain is Rs.15080. This calculator can help you to explore various options available for you to become a non-taxpayer. Anish L J is a ‘Financial Planner’ and member of Chartered Insurance Institute(CII), London and Insurance Institute of India. He is also a finance, insurance and software consultant. He thoroughly follows the developments in finance, insurance, and other related sectors. Top 100 Insurance Blogs on the web. Copyright © 2019 Insurance Funda. All rights reserved.